The opening track, ‘Electrifying’ makes enough of an impact within about four bars to make you sit up and listen. Its opening riff is a dirty, repetitive beast that’s heavy on the attitude, before the drums and bass kick in and Fox Company burst into a world of retro rock with huge 70s grooves. That riff alone is enough to make the track stand – it’s definitely good enough to forgive a one-line chorus – but with an absolutely killer guitar solo and a vocal that falls somewhere between Chris Cornell’s work with Audioslave and a 70s legend, most of the major bases are covered. As ‘Euro Cake’ crashes through with the attitude of The Bad Touch bolstered the meaty sounds of BlackWolf and Big River, the production values on the EP become just as obvious as the band’s own musical talents. These tracks don’t just come with a big, punchy sound – they positively explode. While ‘Euro Cake’ is less groove laden and more concerned with the kind of riff that’ll make an audience jump up and down, essentially, the best traits are the same – the riff is great; the featured solo really shreds and frontman Cal’s voice is very strong indeed. Again, the chorus errs on the side of repetitive, but when it comes glued to such a cool riff and one of the best vocal performances since BlackWolf broke through in 2012, it’s pretty much impossible to dislike, especially if you crave a retro rock style. ‘All In’, meanwhile, gives drummer Ben plenty to work with as he settles upon a semi-funky groove, while Cal’s voice does its best against a very 70s riff. The end sound comes across like a funk inspired Black Crowes and is never a million miles away from fellow Aussies Flickertail. By the time the featured guitar solo is reached, the band are in full flow: Paul’s bass drops into a fat sound; the vocals sound so natural and, finally, a brief drum led interlude is clearly designed to rouse an audience when the time comes. In many ways, this track packs all of Fox Company’s best traits into under four minutes – and yet it still isn’t the EP’s highlight. That would be ‘Higher’, a track showing off Fox Company at their most forceful. Offering a fat riff and bluesy stomp that’s all bass drum and massive chug, there are easy comparisons with Royal Blood. On the bluesier pre-chorus, guitarist Blake adds a few pleasing flourishes, but eventually steals the show during the instrumental break with an impeccably played solo and a multi-tracked section recalling some of the great 70s recordings where twin leads were king. In and out in under three minutes, it really is an exercise in how to pack a punch with the minimum of fuss, while the presence of few vocal effects also helps to make it stand out. Everything on this EP is great, but this is especially powerful, particularly when played loudly. ‘Every Little Thing’ applies another bluesy rock riff to something a touch funkier – there are traces of The Cult’s ‘Electric’ album in the way the riffs chug against a forthright drum – but as before, Cal’s lead vocal is incredibly confident. On this number, he also has a bigger and slightly more complex chorus hook to wrap his voice around and with the addition of harmony vocals in a retro style, everything sounds great. There’s something in the closing number ‘I’ll Get By’ that accentuates the band’s Aussie roots. It could be that Blake’s lead guitar that occasionally hints at classic AC/DC records – particularly the busy riff that sporadically appears – but it’s just as likely down to a harmonious chorus that is more than reminiscent of a couple of tracks from The Screaming Jets’ debut. Whatever it is, it comes together in a way that results in a fine listen. 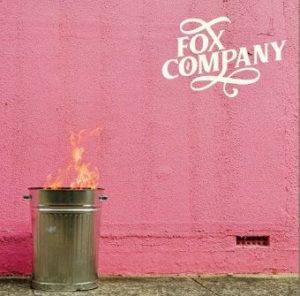 This release only features six tracks – essentially half an album – but each one is so tightly wound and well performed, you just know that had these Foxes stretched themselves to a full release, there would also have been a couple of filler tracks and their overall punch would’ve been diluted. As it stands, this is a brilliant introduction to a band who’ve clearly grown up listening to some fantastic records. If you love enormous riffs in a retro mood and vocals with a rich soul and very commanding presence, look no further. This entry was posted in Album & EP Reviews and tagged aussie, fox company, hard rock, retro by Real Gone. Bookmark the permalink.